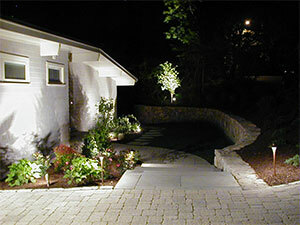 The goal of Landscape Lighting is to transform and illuminate your home and landscape when the sun sets. Daylight flattens out landscape design. The sheer volume of natural light gives everything an equal value: neighboring houses, utility equipment and pool equipment are as well lit as the more interesting aspects of outdoor layout. The most wonderful aspect of landscape lighting or outdoor lighting is its ability to create virtually any mood you desire. Dramatic looks that highlight specific areas, plants, trees, or decorative yard features are easily achievable; as is the ability to soften the mood and set a more romantic or relaxing tone with strategically placed and adjustable lighting. The look and feel of your yard under the stars is up to you, and Briggs Landscape Construction will work with you to get it just right. In addition to the creative features, landscape lighting offers safety and security. Well lit walkways, patios and yards are safer for your family and friends when enjoying your home after dark. Also, well lit homes are also 50% less likely to be broken into. Landscape Lighting offers an incredible expansion of the enjoyment of both residential and commercial properties. It makes outdoor spaces usable at night and adds a magical view into the landscape from interior spaces. Give Briggs Landscape Construction a call today and let us light up your home!